For all you fans of the Twilight Imperium series, Fantasy Flight Games has come out with this Prequel. "The final days of the Lazax Empire began in the seventy-third year of the Twilight Wars, when without warning, the Federation of Sol led a deadly assault directly on Mecatol Rex, the capital planet of the empire itself. A climactic struggle for control of the imperial city followed, fought as much with diplomacy and deception as with troops and starships. This is the story of that struggle. Rex: Final Days of an Empire is a board game of negotiation, betrayal, and warfare in which three to six players take control of great interstellar civilizations, competing for dominance of the galaxy’s capital city. 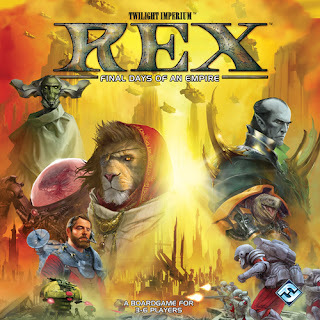 Set 3,000 years before the events of Twilight Imperium, Rex tells the story of the last days of the Lazax Empire, while presenting players with compelling asymmetrical racial abilities and a myriad of opportunities for diplomacy and deception." Rex is a strategy board game for three to six players, set in the Twilight Imperium universe. During a game of Rex, each player takes the role of one of the great races attempting to control Mecatol City. Each race has a set of unique economic, military, strategic, or treacherous advantages that allows it to control certain aspects of the game or even win the game with a unique victory condition. In each game round, players move their units about the game board attempting to collect influence (the main resource in Rex) and conquering areas of Mecatol City. Though combat and conquest are elements of the game, the heart of the experience is about diplomacy, treachery, and brittle alliances. Players must be careful who they trust, and always be wary of sneaky and often sudden victories. To win a game of Rex, players must conquer Mecatol City by controlling strongholds or fulfilling their race's special victory condition. Don't forget, for a fabulous selection of family games, strategy games, Euro-style games, war games, card games, dice games, and puzzles in Gresham and the greater Portland and Vancouver area visit us at Off The Charts Games! We are here to help you put fun back on your table.